This article describes a pocket anagram game I designed recently to help my son improve his anagram-solving skills. It is based on the conundrum game, which forms the final challenge in the Channel 4 TV series Countdown, in which the contestants have to solve a nine-letter anagram within 30 seconds. My Conundrometer contains a complete list of nine-letter words, and displays an anagram of a random word on the display. A timer then gives you 30 seconds to solve the anagram. When you've solved it you press a button and the answer is displayed. If you answered it within 30 seconds you score a point. The red button moves the cursor and the green button copies letters down into the second row. If you fail to guess the anagram in time, or guess wrong, the program displays the answer. Pressing the red button then displays the next anagram. "aardvarks" "abandoned" "abasement" "abatement" "abattoirs" "abdicated" "abdicates" "abdominal"
A quick calculation shows that storing these as standard C strings would require at least 8680×9 bytes, or about 78Kbytes, well over the 32Kbytes available in the ATmega328. It was clear that some sort of compression method was needed to fit them in. Since the words only require the letters A-Z there is no need to use a full byte to store each letter; you can specify 26 letters with a 5-bit number. You can therefore pack a nine-letter word into 5×9 or 45 bits, which is 6 bytes. This reduces the requirements to 8680×6 bytes, or about 52Kbytes, unfortunately still too much. The difference between these is 16423251761 which can be fitted in 34 bits. One problem of this approach is that to find any word we have to start at the beginning of the list, and sum successive differences until we get to the word we want. In practice this took less than half a second in the worst case, an acceptable delay. I came up with a storage method that used a variable number of bytes to store the differences. Each difference was divided into 7-bit chunks; this was output as a sequence of bytes, where the top bit was 0 to indicate that there were more chunks, or a 1 to indicate that this was the last chunk. This reduces the wordlist to within the 32Kbyte limit, but with very little room to spare for the program. "acinomrah" "adalihcne" "adnaromem" "adnerefer" "aducarrab" "aegnardyh" "aehrronog" "aeohrraid"
These are the words "harmonica", "enchilada", etc. This reduced the memory requirement by about 2Kbytes! Presumably this is because the differences are more evenly distributed. The complete set of data is included in the full listing at the end of this post. It sets up the word, encoded as 5 bits per character (0 = a, 1= b, etc) in the bottom three bytes of WordH and WordL. FindWord(1) is "HARMONICA" and FindWord(8680) is "KILOHERTZ". 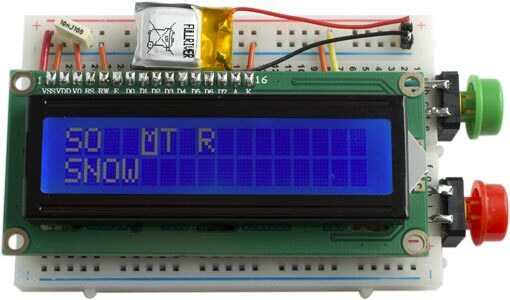 The Conundrometer uses a 16x2 LCD display  which fits on top of the components, and it uses the LiquidCrystal library to drive it. The outputs chosen to drive the display were mainly selected to make the wiring easier on the breadboard. 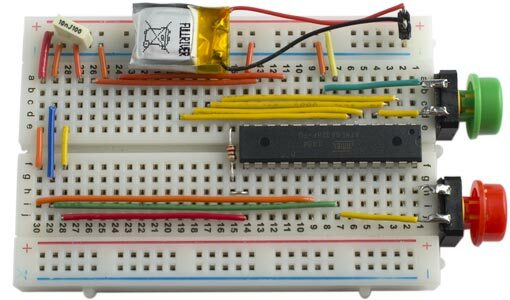 I used an ATmega328 chip with the default fuse settings, which gives an internal 1MHz clock and avoids the need for a crystal. I uploaded the program to the ATmega328 using Sparkfun's Tiny AVR Programmer  (available in the UK from Proto-PIC ). The whole circuit is powered by a 50mAH rechargeable lithium battery; I use the HobbyTronics LiPo charger  to charge it. There's no on/off switch; instead the program puts the ATmega328 to sleep if no button is pressed for 15 seconds. The display is powered from one of the ATmega328 outputs, so the display can be turned off by the program. This reduces the current consumption from about 40mA to a standby current of just 120nA. Here's the whole program for the Conundrometer: Conundrometer Program.